Can you use a mobile cell booster in your home? What’s the difference between mobile and home cell boosters? Actually there is very little difference between mobile and home boosters. Mobile boosters are designed to use the 12 volt DC power supplied by vehicles, while home boosters use the 110 volt power from your outlets. Home boosters are limited to a maximum of 75dB boost, while vehicle boosters are limited to 50dB boost. That may not seem like a big difference but 75dB is actually close to 200 times more boost. But that’s the real difference here. There isn’t any real difference in technology or anything that makes one more special than the other. A mobile booster for home? Actually, this was once pretty common. At one point virtually evert manufacturer sold a kit to turn their car boosters into home boosters. You can even still get one here. If you wanted to turn your mobile booster into a home booster, it’s pretty easy. This Drive Sleek from weBoost is powered using USB so it’s easy to substitute its lighter socket adapter for one with a plug. Just make sure it supports 5 volts/2.1 amps (or 10 watts). Most quick chargers for cell phones will put this out, although the charger that came with your phone probably does not. To install your mobile booster at home just plug it into the wall using a charger that will work with it, and put the outside antenna outside. It’s pretty easy. But then… I’m still not sure why you would want to do it. 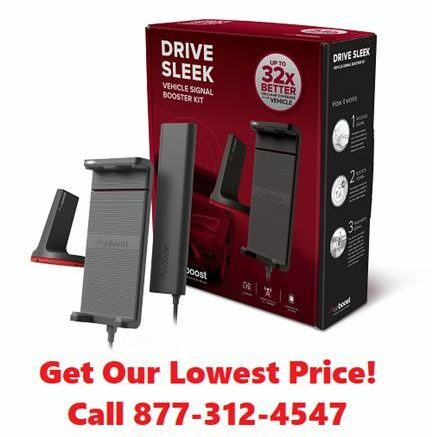 The Drive Sleek has a rated gain of about 23dB. That’s pretty low actually. Remember that the strongest home system has a rated gain of 75dB. The low gain is the reason you have to keep the phone in the cradle. If you move the phone even a few inches from the cradle, the boost is lost. I never quite understood why anyone would want to do this. I suppose the could mount the cradle at a desk but then you’re talking on speaker at your desk. It’s not really less expensive. The Drive Sleek is about the same price as a home booster. There are less expensive options especially if you look at refurbished units, but there are also some dynamite low prices on home units at Solid Signal. Personally I think you’re much better off just getting a home booster for home and a vehicle booster for your ride. A home booster is going to be much more powerful, support more than one device at a time, and the installation procedure will make a lot more sense in a home. On the other hand, if you wire up your car with a cell booster, you’ll very quickly figure out that you just don’t want to unwire it. You won’t want to be without it when you drive. Shop the great selection of cellular signal boosters now at Solid Signal!